This is another of those science fair projects. I thought it would be interesting to use some of my test equipment to measure the signal strength of HF stations over long periods of time (at least 24 hours) using different antennas, and then plot the results. 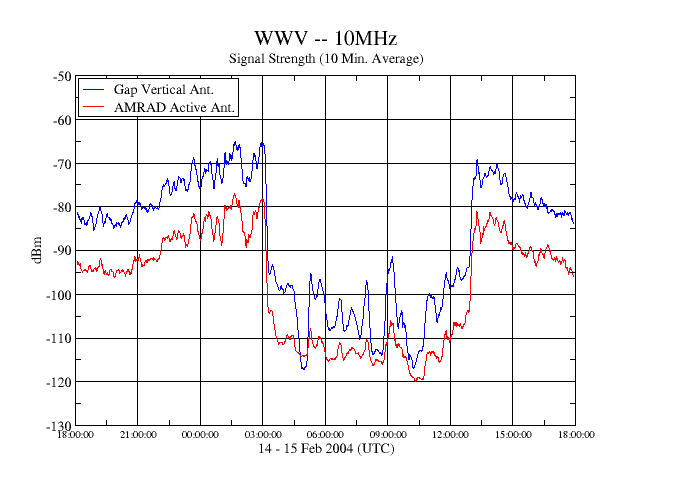 Here is my first effort, a log of the signal strength of WWV (the US standard time and frequency station) at 10MHz, received using a "Gap Titan" vertical antenna (a ground-mounted, 24 foot tall amateur radio antenna) and an AMRAD active antenna mounted on my roof. The equipment consisted of an HP 3586C selective voltmeter and an HP 59307A VHF switch, which is a coax relay that can be remotely controlled via the GPIB bus. The 3586C, which can also be controlled via GPIB, is a 50Hz to 32MHz receiver with high stability, narrow filters, and a very accurate signal strength meter. It has a resolution of as low as 0.01dBm. I wrote software using the Perl language under Linux to control the receiver and switch. The program operates on a 60 second cycle, during which is calibrates the receiver, switches to antenna 1 (the Titan vertical), takes 24 signal strength readings at about one per second, averages those, and then switches to antenna 2 (the AMRAD active antenna), averages 24 signal strength readings, and finally writes a line to a logfile with the time and the two values. I processed the logfile using the Grace "WYSIWYG" plotting program, and the results are here. I'm not sure that these results show anything profound, though the sudden drop in signal strength when the band closed at about 0300 UTC (10PM local time here in Dayton, OH) and the equally rapid increase when it reopened at 1300 UTC (8AM local time) are interesting. This is really a starting point, and I hope to repeat this experiment on other frequencies and with other antennas. 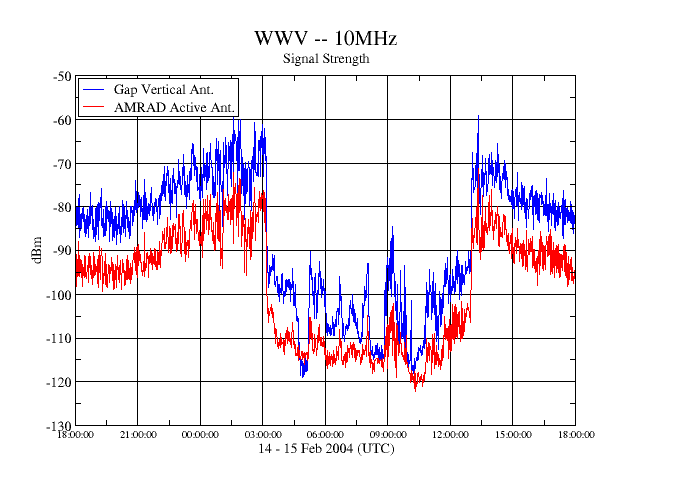 I think a comparison of vertical and horizontal antennas may be revealing; they may respond quite differently as the band opens and closes.